What is the definition of bronchiectasis? What are the signs and symptoms of bronchiectasis? What are the types of bronchiectasis? Who is at risk for bronchiectasis? When should I contact my doctor for bronchiectasis? How is the diagnosis of bronchiectasis made? What is the prognosis of bronchiectasis? What is the treatment for bronchiectasis? Bronchiectasis (pronounced as brong-ke-EK-tah-sis and derived from the Greek bronkhia meaning branches of the lung's main bronchi plus the Greek word ektasis meaning dilation) is the abnormal widening of the bronchi or their branches that usually causes an increased risk for infection. Bronchiectasis is a condition in which the bronchial tubes in the lung become damaged from inflammation or other causes and the smooth muscles of the bronchial tubes are destroyed. In addition, elasticity of the bronchi is often lost. Bronchiectasis may be acquired or have a genetic origin. Many clinicians consider bronchiectasis to be a form of chronic obstructive pulmonary disease (COPD); it includes chronic bronchitis and emphysema. The signs and symptoms of bronchiectasis develop and change over time. The first common symptoms include a recurrent cough and sputum production; usually the sputum/mucous is clear but eventually may become bloody if injuries to the bronchial wall occur. In addition, mucous may change to a green or yellow color when infection is present. As the disease progresses, chronic coughing with mucous production increases and the person usually becomes more fatigued and short of breath as lung function decreases. Some people may develop wheezing; some may lose weight due to the increased effort needed to breathe. Occasionally, symptoms of a primary disease like pneumonia may mask some of the symptoms of bronchiectasis so it may be more difficult to diagnose bronchiectasis if an underlying disease is present. An increasing intolerance to exercise. Bronchiectasis is caused by damage to the walls of the bronchi; this damage consists of destroying the smooth muscles and the elastic tissue that allow the bronchial tubes to contract. Consequently, if the bronchi are damaged, secretions that are normally produced in the lung are not well removed and cause an increased likelihood that infections (pneumonia, bronchitis) can develop. Unfortunately these infections can cause further damage to the bronchial walls producing a cycle of increased damaged and then increased infection. As the cycle continues, lung functionality decreases. As stated previously, the causes can be acquired (infection, environmental exposure, drug and/or alcohol abuse, for example) and/or congenital (alpha-1 antitrypsin deficiency, immotile cilia syndrome, for example). One common inherited cause of bronchiectasis is cystic fibrosis. The other causes of bronchiectasis are sometimes referred to collectively as non-cystic fibrosis bronchiectasis. Some researchers have described three primary types of bronchiectasis. These types are defined by their anatomical/microscopic appearance. Cylindrical bronchiectasis, the mildest form of bronchiectasis that shows the loss of normal airway tapering. Saccular or varicose bronchiectasis shows further distortion of the airway wall along with more mucous and sputum production by the individual; some of the bronchi may appear to be in a beaded form. The most severe form of bronchiectasis and the least common form is cystic bronchiectasis. This form has large air spaces and a honeycombed appearance in CT scan studies and usually has thicker walls than the blebs seen with emphysema. Some people have more than one type in their lungs. Individuals with alpha-1 antiproteinase (alpha-1 antitrypsin) deficiency or an embryological defect termed immotile cilia syndrome. Children that develop lung infections with lung tissue destruction are risk for bronchiectasis to develop later in life. People that have recurrent lung infections, aspirate foreign bodies, have had a history of tuberculosis or inflammatory bowel disease. People that abuse drugs and alcohol. 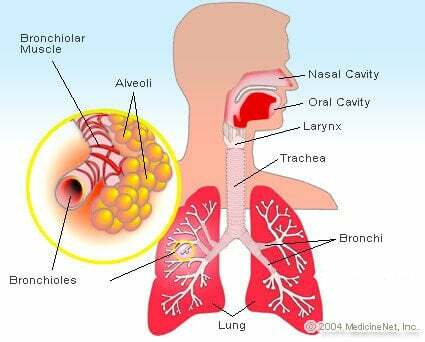 Individuals that are exposed to toxic gases or any substances that damage lung tissue. You should contact your doctor for medical care if you have a chronic cough (lasting about three weeks or more), a new onset of shortness of breath and/or any coughing up blood (hemoptysis). Individuals who have repeated bouts of pneumonia and increased sputum production should also seek medical care. The diagnosis of bronchiectasis usually involves a history and physical exam, with a history being a chronic daily cough and sputum production. 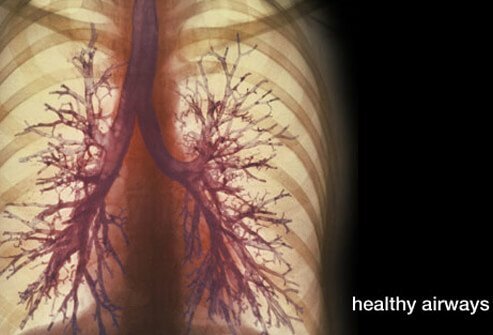 Sputum analysis, chest X-ray and high-resolution CT of the chest (lungs) are tests usually ordered. In most cases, the definitive diagnosis is made with the CT of the chest although occasionally a chest X-ray is sufficient. These exams usually show the changes in the bronchioles that are consistent with bronchiectasis. For some patients, other tests may be ordered to determine if underlined diseases are contributing to bronchiectasis. Such tests include alpha-1 antitrypsin levels, autoimmune screening tests, and measures of vitamin D deficiency as this is commonly found in bronchiectasis and correlates with disease severity. Patients may need to be tested for cystic fibrosis. Chronic infections like fungal infections (Aspergillus) may need to be ruled out. Pulmonary function tests also may be ordered to determine the patient's baseline lung function to help determine the extent of lung tissue compromise. Bronchiectasis due to genetic defects is currently not preventable. However, the incidence in the rate of progression of bronchiectasis can be reduced by avoiding those environmental factors that increase bronchiectasis risk such as alcohol, drugs, environmental toxins and smoking cigarettes. In addition, avoiding those situations that can lead to pulmonary infections can reduce the risk of developing bronchiectasis. Pertussis (whooping cough) in children can lead to bronchiectasis later in life. Immunization can prevent this cause. In general, congenital causes of bronchiectasis (cystic fibrosis, for example) usually have a worse prognosis than bronchiectasis developed from acquired diseases. Those with acquired bronchiectasis can have a fair to good prognosis if bronchiectasis is recognized early and appropriate treatment is done. However, bronchiectasis is often slowly progressive. Those patients that pay attention to getting early and appropriate treatment along with avoiding situations that may exacerbate the disease will likely have a fair to good prognosis. Unfortunately, bronchiectasis is not a curable disease, but a slowly progressive disease. Treatment for bronchiectasis is based on control of symptoms and preventing additional infections. Treatment protocols frequently include keeping immunizations up-to-date, eliminating aggravating factors such as cigarette smoke, alcohol and drugs, and encouraging good nutrition. Increasing fluid intake to keep mucous less sticky is another treatment. Sometimes an expectorant (to loosen the mucous) and mucous thinning medication can help decrease symptoms. Chest physical therapy, which usually involves rhythmic clapping on the back of your chest, can help with loosening sputum so it can be coughed up. If patients acquire an infection, antibiotics effective against the pathogen (virus, bacteria, or fungus) and chest physiotherapy are utilized as primary treatments. In addition, bronchodilators, corticosteroid therapy and, if needed, oxygen therapy is utilized in many patients. Patients with severe exacerbations of bronchiectasis usually need hospitalization and IV medications. Patients with bronchiectasis that is poorly controlled with antibiotics may require surgical therapy. Surgical therapy (or in some individuals, bronchoscopy) can remove mucus plugging, foreign bodies or tumors that exacerbate bronchiectasis. Excessive hemoptysis may need to be treated surgically or by bronchial artery embolization. Some patients may benefit from surgical removal of nonfunctional lung tissue. Emmons, EE, MD. et al. "Bronchiectasis." Medscape. Updated: Jun 05, 2018. Please share your experience with bronchiectasis. What symptoms have you experienced with bronchiectasis? What treatments have been helpful in treating your bronchiectasis? Has your bronchiectasis progressed to a more serious type? What were the changes you noticed? How is your doctor testing you for bronchiectasis? Please share your experience. What factors do you believe put you at risk for bronchiectasis? or to remove a mass or growth blocking the airway.